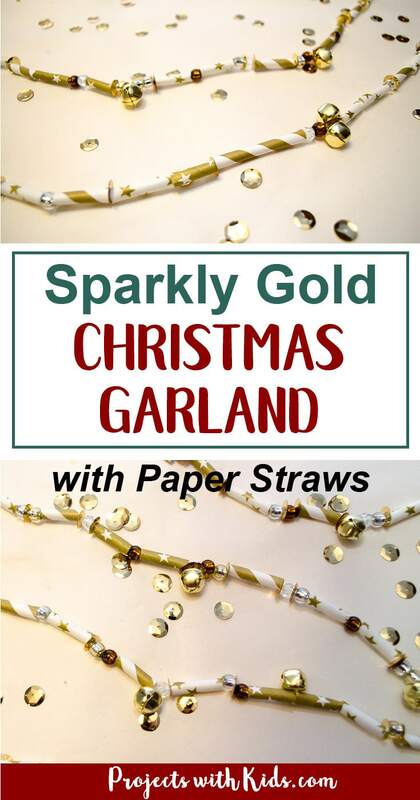 This Christmas garland with paper straws is sparkly and shimmery and would be a gorgeous addition to any Christmas tree or mantle! Paper straws are so fun and versatile to craft with, there are so many colors and patterns, they are becoming one of our favorite craft supplies. This is a simple and easy Christmas craft to make, perfect for preschool aged kids and makes a great fine motor skills activity. 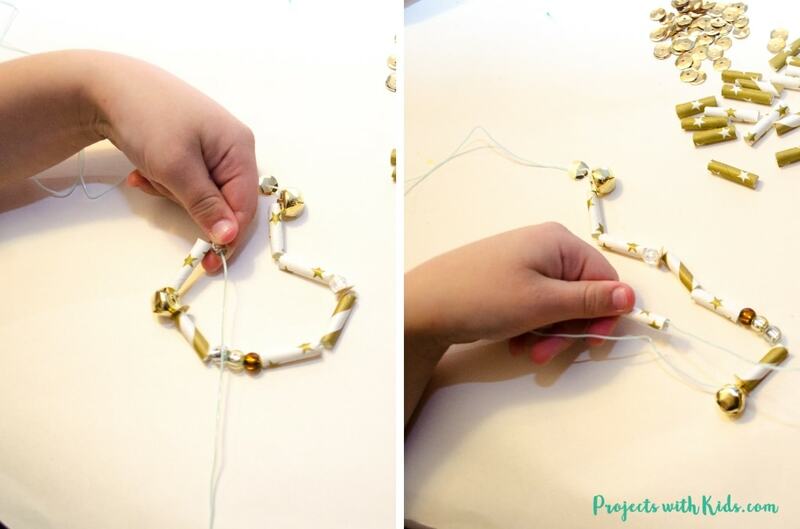 This project had my kids focused and creating for quite a while, it was easy enough for my 4-year-old to do without any help and my 7-year-old loved stringing all of the sparkly beads and sequins. We can’t wait to put it on our Christmas tree this year! 1. Cut each paper straw into 8 pieces. I found this to be a good size, any bigger and the pieces are a bit too long making it frustrating for younger kids to thread through the string. 2. Gather your straws, beads, sequins, and bells and sort them into containers. 3. 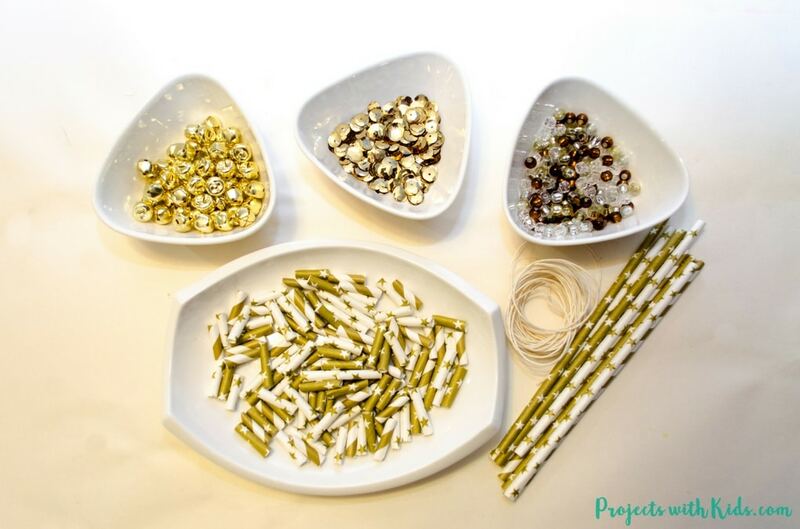 Cut your string to your desired length, you want to make sure that the string goes through all of your beads and sequins easily. We wanted to wrap our Christmas garland around our tree so I made our string fairly long. I gave each of my kids one end of the string to use so they were stringing everything onto the same garland and meeting in the middle. 4. 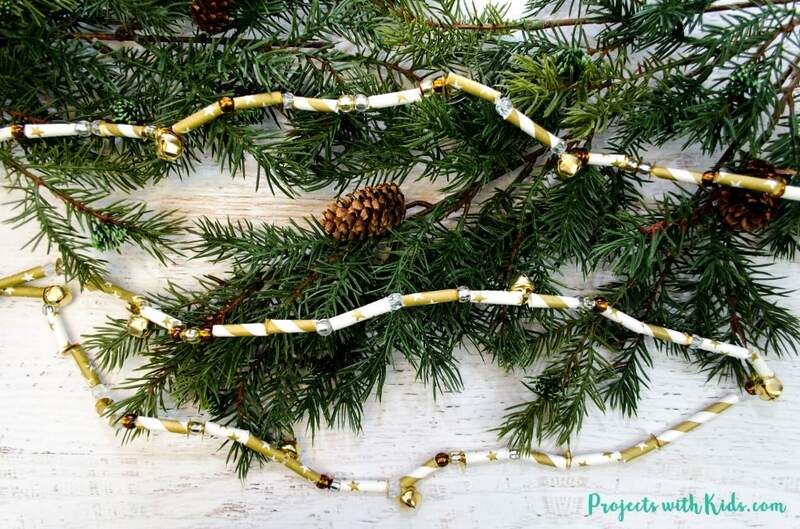 Let your kids have fun creating your beautiful Christmas garland! Tie both ends securely when the garland is finished, making sure that the knots are big enough so that they don’t slip through any of the beads. I love how our Christmas garland turned out! 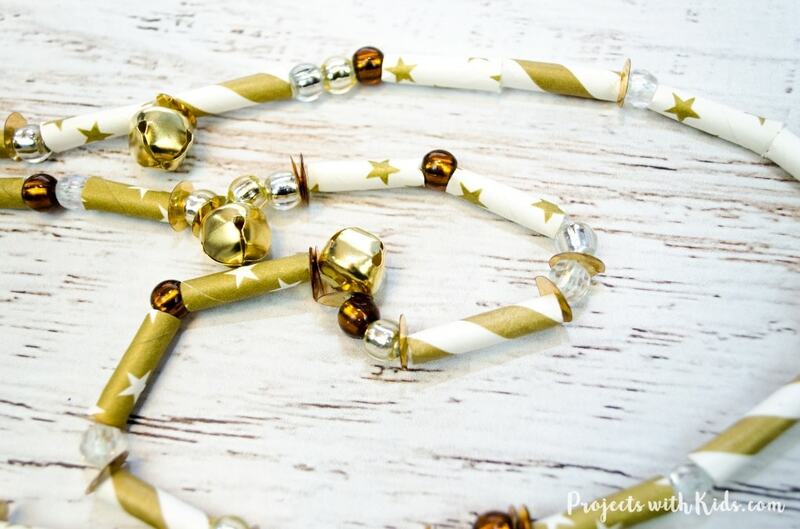 All of the straws, beads, bells, and sequins are so sparkly and beautiful and will look so magical wrapped around our tree. Both my kids love stringing beads, they loved this project and are so proud of their finished garland. We love crafting with paper straws, check out these easy kid made wreath ornaments with paper straws that are so fun and colorful! 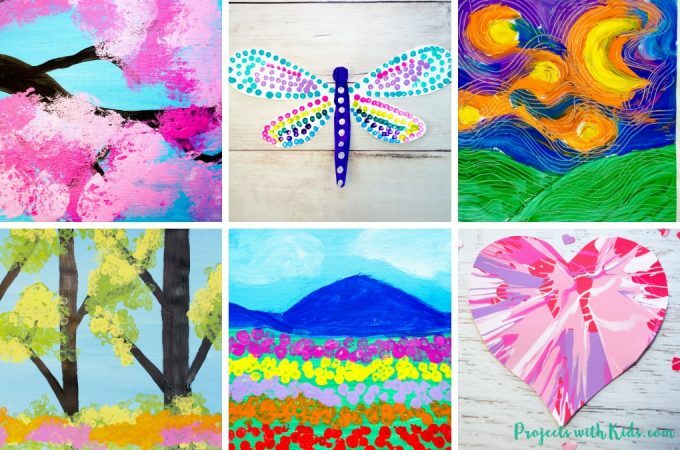 Be sure to follow me on Pinterest for more great project ideas! Such pretty garland. I cannot believe those are paper straws. They look so much fancier to me! Great idea! 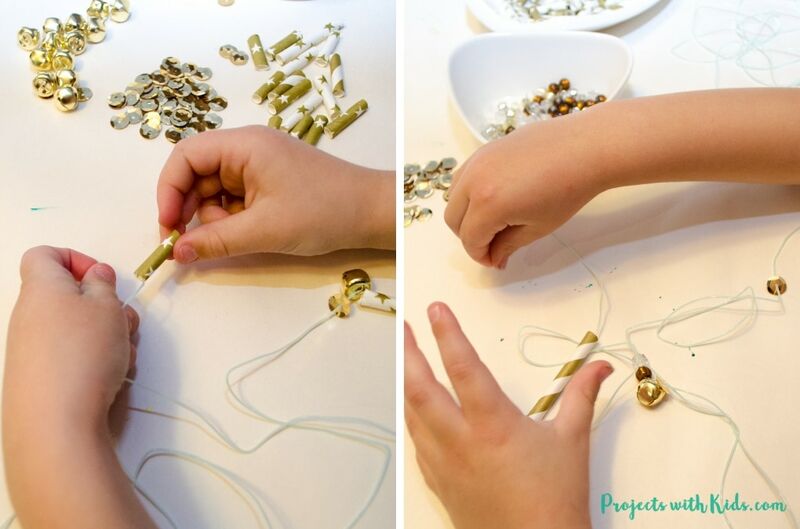 I love that my kids will be able to help and it will be such a good motor skill building activity! Thanks Bree! It’s a great fine motor skills activity, my 4 year old really loved it. This is a really cute idea! It uses such simple supplies too. Omg so pretty! That would be beautiful for New Year’s Eve. It looks like it would be therapeutic to make, too. Like making jewelry! Yes, it would be great for New Years too! I’ve never thought of doing something like this. Great for fine motor skills. Thanks Tamara! My 4-year-old loved helping with this, definitely a great fine motor skills project.